version 1 released Feb 2, 2018. Currently 26 levels. All Levels have been tested; should be all solvable and all bonuses should be obtainable as well. Please let me know immediately if a level is unsolvable or of any other problems. This pack has no custom music atm. Any feedback is welcome. Post here: or PM me. 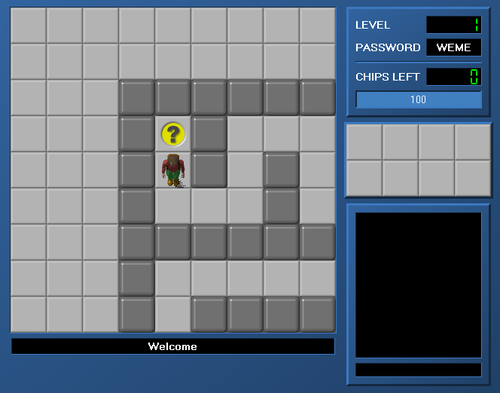 Currently the Chip's Challenge wiki kind of allows people to make pages for some custom levels that are not in a CCLPx. There is some problems with this, like cluttering the level categories. Should http://chipschallenge.wikia.com/wiki/Category:Levels_with_bold_difficulty_5 just list official levels? On the other hand, some custom levels could use their own page, but not every level seems to have enough merit for this. One alternative would be to allow custom sets to have their own page and any notable levels in that set could be expanded on in that space. Then the question expands to which custom sets should have their own page? Would love to hear your thoughts. And if someone has more power over at the wiki than most users, I would love to suggest some other things too. So, people have been wondering if there could be CC Zone awards for completing specific custom level sets. I am not 100% sure on this so far, but I'll leave this thread open for ideas. I think it would be great for it to be levelsets of 149 levels and all of them to be solvable, but it may not be a requirement yet, so I'll keep this open for opinions. Most difficult levels in existence? What are the most difficult levels to solve that exist? What makes them difficult? Which ones have you completed? I would think there's at least two types of difficulty here: hard to find a solution and hard to execute a solution. Of course some levels can be both. I'll make a list too, just don't have it right now. You have downloaded BigOto Returns v1.2. BigOto Returns, or BigOto7.ccl, is © Trevor Hedges (BigOto) 2012. The set may be used for consideration in CCLP1 and all future level distributions whether "official" or not. DO NOT redistribute these levels individually or under anyone else's name; all credit for these levels used in any distribution must go to me. To play this level set, simply download Tile World and then merge the folders in this download with it's folders. It will then show up at the main menu. I have mainly tested the set in Lynx but if I am suspicious that a certain part may not be MS compatible I test it there too; thus I am almost sure that every level is compatible in both rulesets. CCLP1 staff please confirm that all levels are solvable in both rulesets, and I will apply the appropriate fixes when needed. The levels start out easy with simple lesson concepts (some of which are admittedly stupid), and gets much harder as the levels get higher. There are 100 levels in total, but at some point I may expand to 149. Some levels were originally in my older set PB Gourami Levelsets (PBGA.dat) and have been modified to work in Lynx, while others are completely new and have never been seen before. If you have any questions, concerns, or fixes that you want me to make, please post at the CCZone level discussion forum here: http://cczone.invisi...vel-discussion/ You can also contact me there, at the username BigOto2. Please do not contact me on YouTube as such messages will be ignored.